I had my first Chi Running Clinic last night. A myriad of issues landed me with a private lesson over 90 minutes away from my house. I first learned about Chi Running from some friends: Alexis and Wendy. 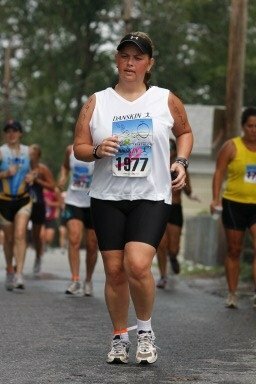 I was exited to learn that I COULD potentially run without pain or frustration. Prior this, I absolutely HATED running. My knees, chest, shins, feet always hurt - and it was just BBOOOORRRRIIINNNGGG!!! I had signed up for a clinic at the Boston Multi-Sport Expo. I had a blonde moment or something and signed up for the wrong class (advanced). Luckily Ryan, one of the instructors, said he would be happy to bring me up to speed personally at another time. (Thank goodness, or I would have been out $55). This turned out to be a blessing in disguise! I bought the book and the DVD. I read most of the book before my Chicago Trip, thus the reason I was able to do 30 miles in a week. For those that don't know - Chi Running concentrates on posture, balance and using "the force" to run, not "leg muscle power." - One thing I just love is you don't bounce around when you're doing it in the right form. This for me means no knee or chest pain! I was armed with 30 miles of practice, a book of knowledge and a private class! I came to the clinic with an open mind that "I'm going to run." - I haven't adopted "Born to run" but hey I'm starting somewhere! Ryan was encouraging, I told him the areas I thought I already had problems with such as holding my head in the correct posture (problem for me in swimming, walking, and just sitting at my desk) and YUP, that was confirmed. He identified a couple other areas for me to work on, such as not showing the bottoms of my feet to the person in front of me - apparently that's what caused this MASSIVE knot in my calf from my Chicago "marathon." He also said that I "got" the basics quicker than most (YEA, I needed that after that stupid bike ride). The really weird thing is someone telling me - five foot one Laura - to "shorten my stride" - REALLY?? - I must become a V8! I'm excited to try to run again, even short distances. Ryan invited me to run with his group on Wed nights & I really have to get over my intimidation of 'holding people back.' I know I am a turtle, but he said that the faster runners NEED to have slow people with them, it makes them stop and think about their form because they tend to forget :)..... ok I'll take that. There is so much to think about that I won't have time to be bored. Hopefully I'll RUN the whole race on May 9th :). Awesome, Laura! Keep up the great work. Glad you liked it. What are the details for Wednesday nights?